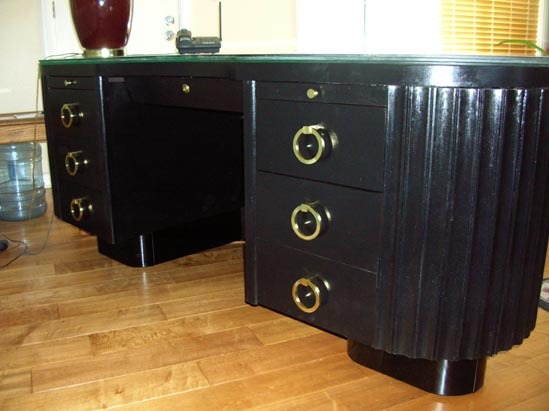 Art deco furniture has an appeal to those who appreciate texture in their designs. 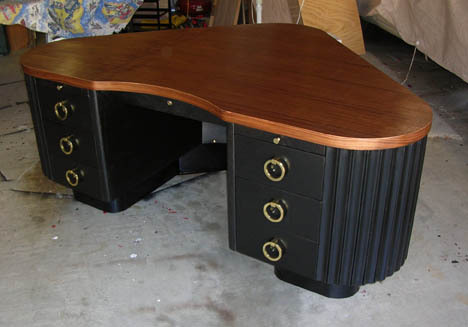 We recently acquired three art deco desks as designed and built by California-based Fletcher Aviation Company. All three were in dire condition. Wear and tear combined with water damage to push these desks to the brink. We first thought we'd take them to the shop, cut them up, and donate them with appropriate honors to the trash bin. They proved too interesting to simply toss and it occurred to us that with some effort they could be saved. Click here to see how far these came. 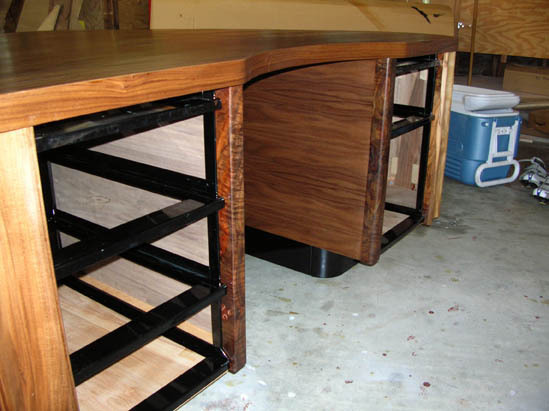 Scroll down through this page to see how all three desks turned out. We retrieved three desks. Two were in very rough but serviceable condition while the third was beyond repair. We harvested the hardware and metal parts of that third piece to build one up from scratch. All three of these desks are SOLD. The two black ones went to the Modernism Gallery and may still be available through them. With the popularity of these desks and our knowledge of their construction, we are considering offering modern desks in the Fletcher style as custom pieces. Contact us if you want one. Fletcher Aviation was based in Pasadena, California and produced flight trainers for the US Air Force in and around WWII (the current iteration of Fletcher is AJ Industries of El Monte, CA). Exhibiting a wide range of engineering flexibility, Fletcher made complete tail assemblies for the Douglas A-20, built bomb racks, plywood fuel tanks, wheel wells and engine nacelles for the F-61 Black Widow. Brothers Wendell, Frank, and Maurice Fletcher developed the highly successful company by designing advanced aeronautical products to solve problems for the US military. 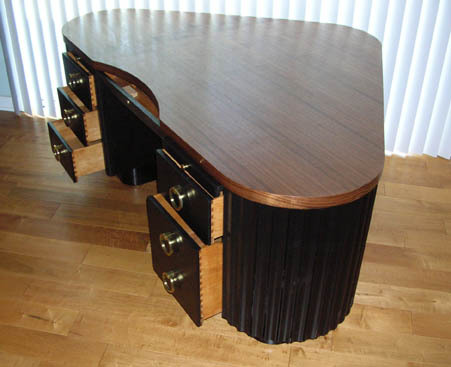 The story behind this art deco furniture design reveals how Fletcher applied engineering tactics to an office space situation. Fletcher had several employees go off to fight in WWII. These employees were replaced with new ones. Once the war was over and the soldiers returned, Fletcher wanted to keep both old and new employees. But there's only so much office floor space available. So Fletcher designed this desk to fit into a corner. This allowed them to place four people in the space previously occupied by two. 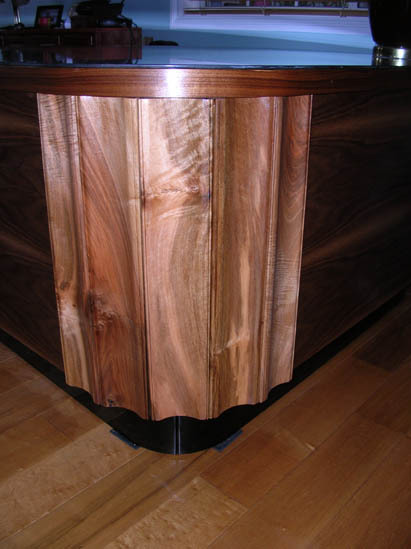 Rounded corners are sculpted from walnut, producing the art deco furniture look so prevalent at the time and popular today. Solid brass hardware, dovetailed drawers, and thick glass transform the Fletcher Aviation desk from appliance to piece of art. 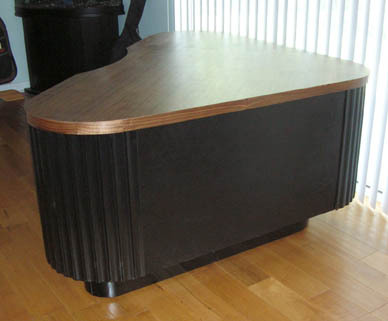 Fletcher desks were made primarily of walnut plywood. Metal was used for drawers slides and the six-inch lift base. The base was painted, wood was finished clear. 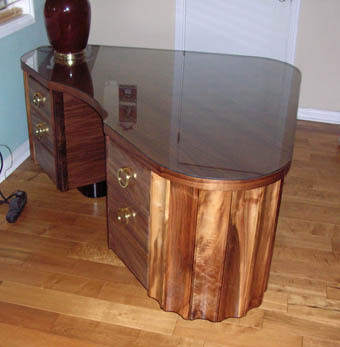 In later life, many Fletcher desks were painted to cover abused finishes. We chose to repaint our two restoration projects after extensive sanding. The tops are made of 3/4-inch plywood. Due to water damage, we had to relaminate both of our projects. One we painted, the other we used a fresh walnut lamination with hand rubbed oil finish. 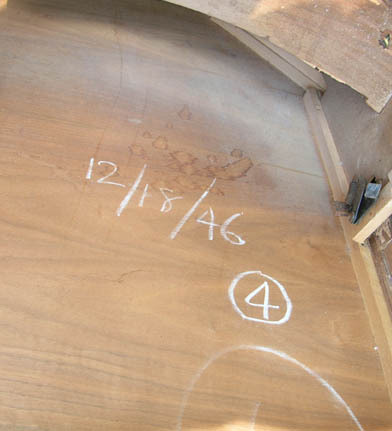 Original build dates are clearly written in chalk on the underside of the tops. 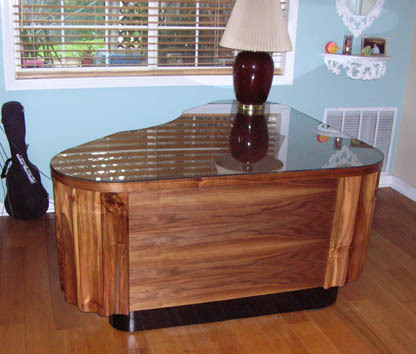 The black top is 12/18/46 while the walnut veneered desk 1/31/47. Oh yeah, we kept that on there. In restored condition, these two desks are roughly 80% original. There are three standard drawers to the left, one standard plus one deep drawer to the right, and a thin drawer in the center. The original drawer locking mechanisms could not be saved. We did replace the center drawer lock with a nifty brass piece. We have the original glass tops (some of the photos here have the glass in place, some do not—glare becomes an issue). 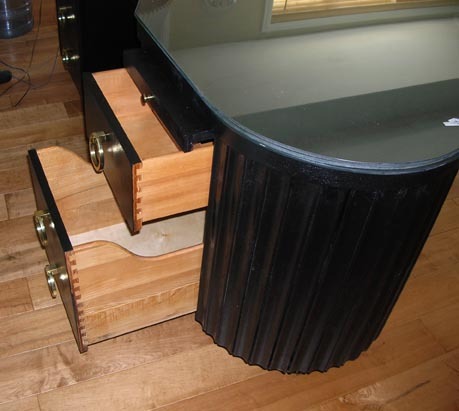 Prior to this art deco furniture project, we didn't know much about the period. Our appreciation has certainly grown. Here you can see that the original hardware was polished then powder coated clear to keep fingerprints to a minimum. The base was sandblasted and smoothed then powder coated black by Andrews Powder Coating in Chatsworth, California. Andrews also cleaned and coated the drawer slides. 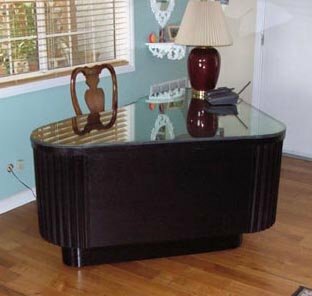 We used black because it fits with the desk design. Our from-scratch Fletcher desk was built around the harvested metal parts of a desk that was well beyond repair. We cleaned and prepped the metal, used our other two desks as templates, and built this piece from walnut plywood as well as solid black walnut. The original Fletcher drawers were dovetailed. We decided to build our scratch drawers with box joints and separate walnut front. 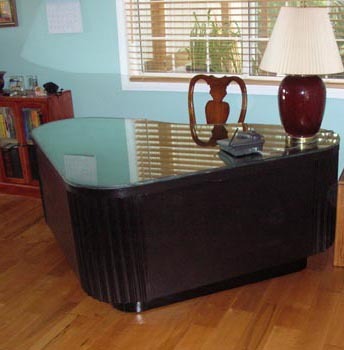 Shown here with the glass top in place, the grain, texture and design of this piece of art deco furniture really come through. The desk is a standard height of 30 inches. It is six feet wide and four feet deep. We're not certain of the weight, but it's not much. Sculpting the corners presented us with a woodworking adventure. 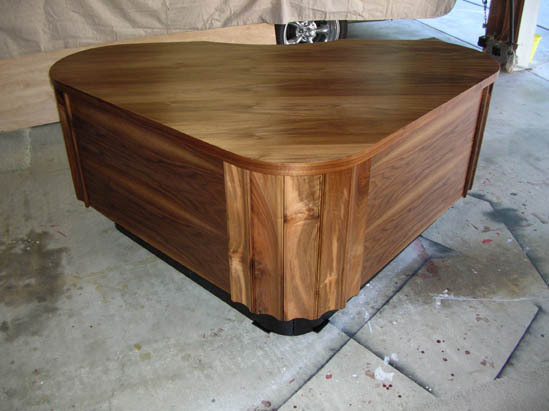 The corner shown here is made of five separate pieces of California black walnut. Each is beveled to accommodate the 90 degree angle. We produced the deep cove by making multiple passes with our table saw. A bead detail was routed on each long edge. We continued the bead theme on the solid drawer fronts. Reverse-engineering the Fletcher desk was complicated by it being designed and built by aircraft guys instead of woodworkers. In some places where six screws were used, often only four of them matched. Panel sizing was inconsistent between our two restored desks, typically where a given edge went out of sight. Restoration of art deco furniture is beyond the scope of most beginning woodworkers, but we are quite pleased with our results on these desks. The project contained elements of woodworking, engineering, history, and archeology. Our walnut desk sold very quickly. Contact us for sale information on the other two. Both are in easy to find public locations in the Los Angeles area. Restoration pictures and story here.